The cold months of November through February can provide a bit of a change from the normal, hot Phoenix months in the summer. However, when a cold snap comes in, it can exaggerate already-existing windshield damage by changing the temperature of the glass and making it weak, vulnerable and prone to cracking. This, of course, can make a small chip or crack begin to spider across the car windshield, resulting in an entirely unsafe car part and possible windshield repair and replacement. Glass, like all other materials, tends to change its molecular mix when the temperature changes. Cold is particularly damaging on glass that has already been weakened by a prior impact. Normally, when the windshield is whole, being laminated glass, it can withstand temperature changes just fine. But when a break already exists during the warm months, the stretching and contracting of the glass with temperature changes can make a crack start to expand when it gets cold. In a worst case scenario, the windshield can catastrophically fail when a person is driving and the car suddenly gets put under immediate stress, such as when a small debris hits the window at high speed on the highway. The windshield itself serves a vital purpose for the car and is often taken for granted. While it provides a clear surface to look through it also provides a primary shield for any floating debris in the air while driving. This is why it is so important to make sure that the windshield will always function as needed when driving under any condition. If you think your car or truck windshield is potentially compromised or weakened in some manner, don’t wait for the end of year winter season and a cold snap to make it clear the glass needs replacement. 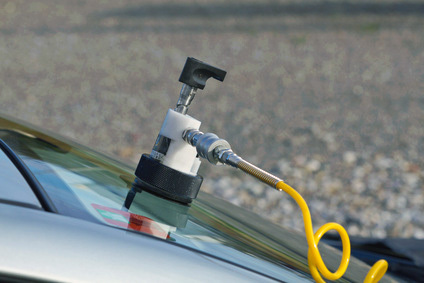 A clean and complete windshield replacement can be had very easily, even at a remote location. Removing the old, damaged windshield can be performed quickly and a new one installed in a short time with proper, weather-resistant sealant to keep it in place. Then, within a day or so, a driver can be traveling with a completely new, clear and safe windshield without any worries. So if you’re looking for automotive glass repair, Blue Chip Auto Glass is available for a call.